While it's a nice idea to think that Saturday Night Live hosts are booked on their merit, usually the stars are brought on to appear on the sketch show when they have a movie, an album, or some other project to promote. And, who has more interest in self-promotion in the year leading up to an election than the candidates seeking either party's presidential nomination? Unless you live in a blissful cone of media silence, you've heard that Donald Trump is hosting SNL on Nov. 7, a move that's prompting some outcry and even boycotts among viewers, due to his incendiary comments about race and income inequality. Still, those boycotts will likely not put a dent in the ratings, considering the millions who will tune in either because they support Trump or because they're morbidly curious about what he'll be asked to do. And if Trump can be booked to host SNL, why not his opponents? 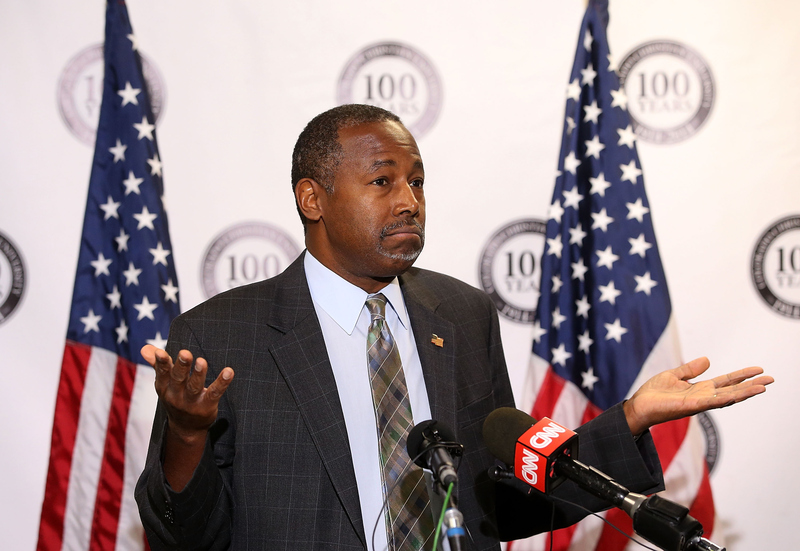 Will retired neurosurgeon Ben Carson make an SNL appearance? He's been gaining traction in the polls, so could he be the next candidate to step on stage at Studio 8H? Personally, I'd be shocked if Ben Carson were asked to host Saturday Night Live. Whatever you think about the show's decision to put Trump front and center right now, the mogul has hosted the show before. In 2004, just as The Apprentice was getting off the ground, he emceed an episode for the first time. And, of course, he's plenty used to having cameras in his face. Carson is an unknown property, and doesn't have the name recognition outside of politics that Trump does. Maybe he'll drop by for a Weekend Update visit, but I think that's the most audiences will get of Ben Carson on SNL. Outside of the writers dragging him, of course. In the alternate universe where Ben Carson actually is a viable choice for hosting SNL, he'd likely appear in these sketches. Naturally, Carson would appear on SNL's spot-on parody of Fox & Friends, because the whole point of a divisive person being on the show is to soften their image by making fun of themselves. Maybe Carson and the clueless anchors could discuss some of his more head-scratching comments, like that time he said that "many [Americans] are stupid." I want a revisit of the sketch from the Lena Dunham episode, with Sasheer Zamata as Olivia Pope hired to "fix" another one of Carson's bonehead statements, like when he compared Planned Parenthood to "Nazi Germany." Ben Carson would have to step into one of SNL's debate parodies to go toe-to-toe with their cast versions of his opponents. The actual debates have set a high bar of ridiculousness, so the pressure would be on for the writers to at least match it. A Ben Carson episode of SNL would be wild, but odds are that it will never happen. But, we live in a world where Donald Trump is actually running for President, so I guess never say never.